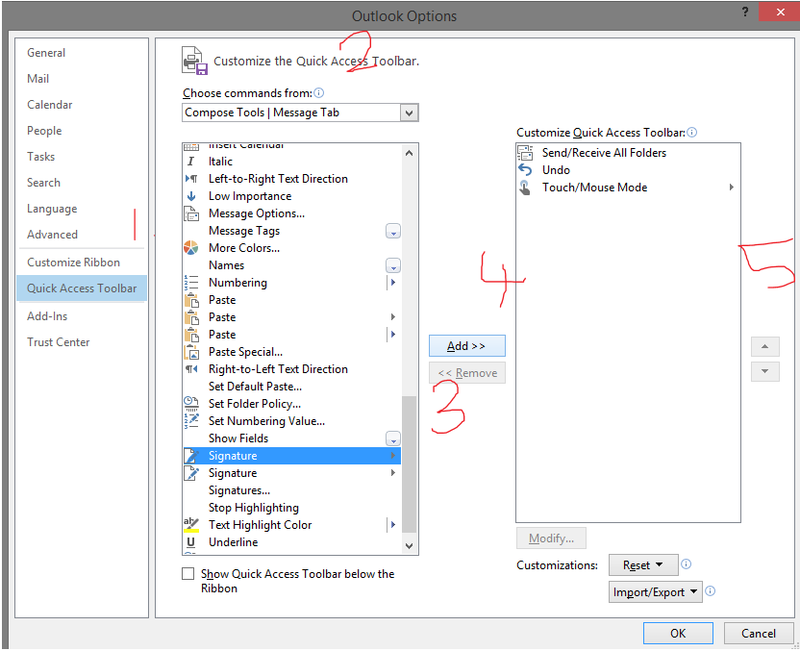 A new feature in Outlook 2013 lets you can reply to messages, ‘in-line’ from the Reading Pane. Instead of opening a reply to an email in a separate window, your reply is crafted within the Reading Pane. Personally, I like this feature because it helps me reduce the number of windows I have open on my desktop. If I need to open my reply in a separate window, I use the Pop-Out button. But some people find Reading Pane in-line replies, a pain. Make your replies open in a new window every time by clicking through File > Options> Mail > Replies and Forwards > select Open replies and forwards in a new window. For those of you who want to keep using the Reading Pane in-line reply, here’s a tip to make adding your signature more accessible. I like to use keyboard shortcuts a lot. I touch type, so with my fingers already on the keyboard, it’s often faster to use shortcuts than it is to use a mouse. While the Ribbon menu is useful for mouse and tablet, it often adds a few extra steps to keyboard shortcuts. Adding a signature while crafting an email are the keystrokes Alt – E – A -S. What if it was just Alt – number? The order of the buttons determines which number you will use as the shortcut. I like to put the Signature button in third position.